The shivering started halfway through my frozen fruit smoothie, and I had to put on house shoes and a sweater in order to finish breakfast. The temperature dropped to 41 F last night, which means I can wear clothes made out of things besides cotton or linen and not feel like I’m dying. Praise the gods, the weather has truly cooled off in Texas. Something about the shift into fall seems to wake me up, like a creature that hibernates through the blistering heat of summer and craves cold air and long nights. Our Halloween party is this weekend. We’re scrambling a bit this year, because of Reed’s business trip earlier in the month, but Dracula’s tomb is slowly coming together. We have been studiously watching the Hammer Horror vampire movies, with Christopher Lee as Dracula and Peter Cushing as Van Helsing. Several of them are surprisingly good, and it’s a shame how hard they are to track down. They’re campy, with the blood effects done with thick red paint, but the acting is generally excellent and the writing ranges from bizarre to almost brilliant. I still have to figure out food for the party. I had a vision of hors d’oeuvres inspired by weird 1960’s party food, really bizarre cheese sculptures, that sort of thing. We’ll see what actually happens. And we aren’t making boozy punch this year, which is a big deal. Last year I got a bunch of black box wine, and noticed that that was totally demolished, while the alcoholic punch was hardly touched. Apparently this is a sign of a maturing crowd. So we’ll have punch for the kids, and some kind of liquor on hand for anyone who really wants something sweet and boozy. I still have to find my costume. I want to dress up as Peter Cushing’s Van Helsing, which means finding a ridiculous tweed suit that fits me, a gray wig, and some scar makeup for my neck. That’s going to take some doing, and I probably will have to do some pretty intense thrifting tomorrow after I finish whatever client work I do for the day. I am glad that it will be cold Saturday night, so that costume will work. 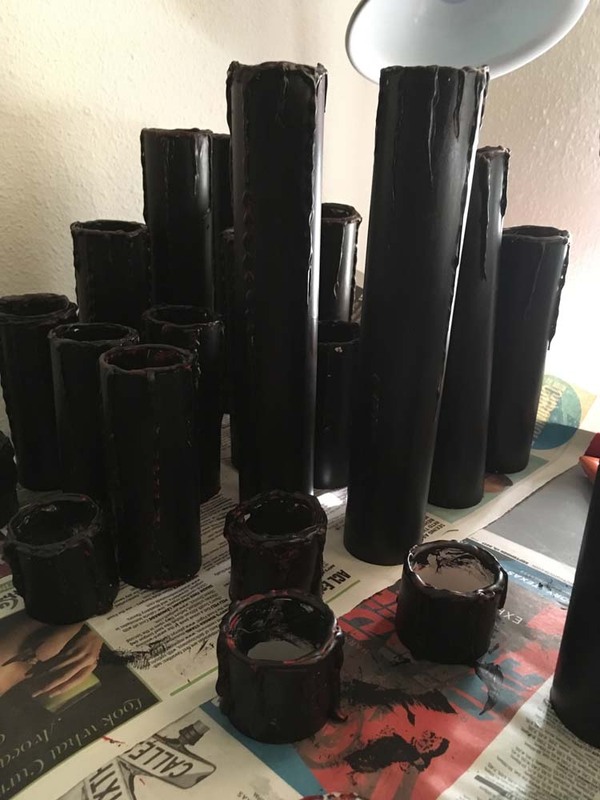 I’ve been working on these black LED candles for our ‘Satanic altar,’ which is a reference to a couple of Hammer films where Dracula is resurrected by a dark ritual. They’re made out of PVC, hot glue, and battery-powered tea lights. I want to do one more layer of highlighting the drips with red, then I think they’ll be good to go. 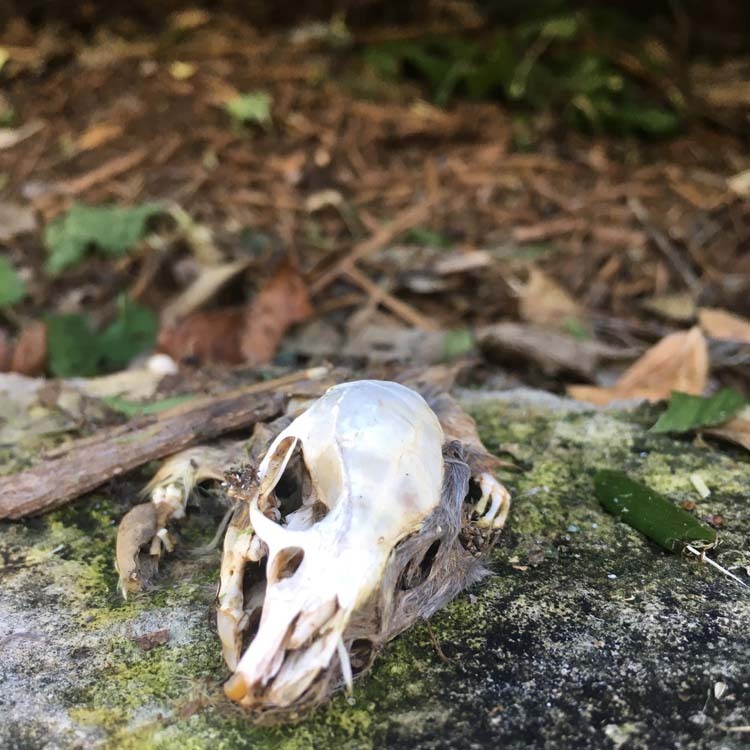 While out enjoying the cooler temperatures, I found a gruesome surprise peeping out of the landscaping of our apartment building. I’m pretty sure it’s a squirrel. Can’t you just hear its ghost squealing, “Happy Halloween!” as someone walks by? I need to go air out our cold weather clothes and assess my collection of hot tea. It hasn’t been cold like this before Halloween in several years. I’m curious to see what it bodes for the winter. I may need to switch from fruit smoothies to some sort of hot breakfast soon.